I remember so vividly the morning of September 11, 2001. I’m sure you do as well. My typical morning routine was not to have the television on but on that particular day I just wanted the background noise while I was getting ready. My children, seven, three and three years old were playing and doing their normal thing. As I walked into my bedroom where the TV was on, I noticed I was hearing Peter Jennings speaking. This caught my attention because Peter Jennings was the night time anchor for ABC World News at the time. I turned out of curiosity to see why he was on and while I listened in concern to what had happened in New York, I watched as the second tower was hit. I was no longer just concerned, I was terrified because I knew. I went down on my knees and prayed. My large, beautiful, false-sense-of-security BUBBLE was obliterated. I called my husband at work because I knew that unless someone came in the store to tell him, he wouldn’t know. It wasn’t long before he was home. I took the kids outside and was afraid when I saw planes flying. I spoke to my neighbor and he was already talking about war. I just wanted to feel safe and more than anything, I wanted my children to feel and be safe. Then came weeks of television coverage that you didn’t even have to have cable news to receive. There are many stories written about that day. There were so many acts of heroism, rescues, losses and devastation. I read someone else’s story while on vacation this summer. She experienced the horrific tragedy first-hand. 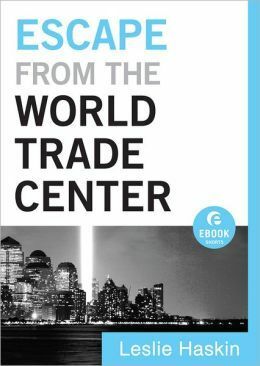 Escape from the World Trade Center is Leslie Haskin’s story. Ms. Haskins takes you through her entire day beginning with her morning commute, her reaching her offices located on the thirty-fifth and thirty sixth floors of the North Tower, (Tower One), her dramatic escape and her eventual arrival home. She, like so many others, suffers from PTSD and part of her therapy is the painful act of journaling all that she can remember of that day. Of course there is much in this book I could never relate to but there were things there that did resonate with me because we all experienced that day in varying degrees. “I looked back to Manhattan Island in stillness. There it stood in the unfamiliar magnificence of surrender – WEAK. Then, in almost perfect rythym and easy gracefulness – in a huge cloud of black smoke – over in seconds – gone – FAILED. Tower Two surrendered her ghosts – COLLAPSED. Take time to remember today. Mourn with those who mourn and remember all that was lost. And then, in your own part of the world, LET FREEDOM RING. I remember being at work when your Dad called me to tell me about Tower One, didn’t know then if it was an accident. I turned on CNN network just in time to see the Second Tower being hit. By that time it was all over the floor, all work had stopped and every eye was on the news. As people all over the world tried to tune in, the website crashed and those who couldn’t get on, were crowded around those who were. As a manager, my workers were asking to leave, to see about their kids and to get home. Upper management decided it was best to shut down the service center and send everyone home thinking that an attack could also be coming against us as 4th largest financial center in the US. It took a very long time to get 5000 cars out of the parking lot that day, as all stop lights had to be obeyed and there was no one to direct traffic on the main roads. Afraid of a bottleneck on the interstate, your Dad wanted me to come home using back roads. He was standing outside waiting on me to arrive. Fear, compassion, bewilderment, and sadness were oppressing over the next few days, then anger and resentment and worry over a lost sense of freedom and security. My prayers go out today for all those lost and those left behind, who were victims and heroes that day, and especially for our leaders as they try to avoid the same or worse attacks in the future. God is in control, but we must cry out to him and realize that He alone is our only Hope. May the Lord protect us today as we mourn the day of September 11, 2001. I get chills reading people’s “where I was when” stories. I guess because I can relate…it’s not some vague historical thing for me either. I was starting to recover from postpartum depression at that time – had a two year old and 2 month old. And I was finishing up my bachelors degree, so I was in class that morning. The day moved in slow motion after that though. I read Psalm 27 and it fit perfectly for my personal struggle and what the nation was facing. I read it every year on 9/11 to remind myself and remember all we lost.